Kenneth Stanley “Bud” Adams Jr. made many contributions to professional football as an owner and literally changed the landscape of the National Football League forever. At the time of his death in 2013 at age 90 he led all active owners with 409 wins. His long life of dedication to football and footballs fans led to many accomplishments. Wildly successful financially in the oil industry, Bud Adams had the capital to invest in a professional football team. Early on, he partnered with later Kansas City Chiefs owner Lamar Hunt to try and buy the struggling Chicago Cardinals of the NFL with the intent of then moving them to Texas. The duo would be denied that opportunity. But that disappointment would set a course for a journey that almost everyone else who tried, failed at. This monumental task was to start a viable professional football league to compete with the NFL. They would go on to found the American Football League (AFL) with Bud Adams starting the Houston Oilers franchise, and Hunt starting the Dallas Texans (now Kansas City Chiefs) in Dallas to fuel a Texas regional rivalry that would go on to thrill fans. The league was initially composed primarily of players viewed as NFL rejects and second tier players. But Bud Adams shocked the football world and got the attention of the NFL by outbidding them for the services of Heisman Trophy winner Billy Cannon. Others followed Cannons decision and found themselves in the AFL which started to place a better football product on the field. The league was not without its problems as a presence in New York seemed critical to competition for fans with the NFL. The Titans of New York (now the New York Jets) were largely ignored by New York fans and media. Adams stepped in and loaned money to the failing franchise to keep it viable and its league competitive. The Jets went on to upset the Indianapolis Colts in Super Bowl III which legitimized the former AFL teams after the eventual merger, something that never would have happened without Adams financial help. 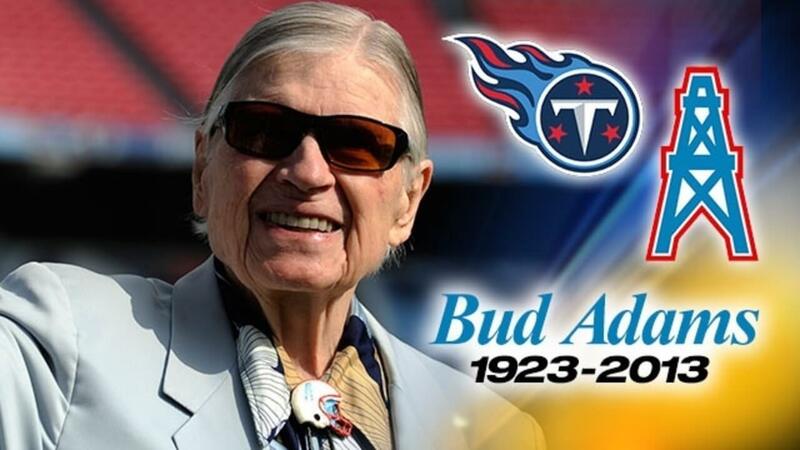 Bud Adams had an early success himself winning the first of two AFL Championship games as the Houston Oilers owner. Former Chicago Bears kicker/quarterback George Blanda was at the helm of what was one of the leagues most high powered offenses of the time. As more and more stars began to see the AFL as a viable alternative to playing in the NFL, the NFL was forced to come to the table and start discussing their options. The NFL agreed to take in all 10 AFL teams and the two leagues would compete for a spot in what they decided to call The Super Bowl. Now seen as almost a national holiday, the Super Bowl may never have existed without Adams shrewd maneuvering of the business side of football. By forcing NFL owners to sit down and negotiate a merger, Bud Adams and Hunt had accomplished what they had originally set out to do by owning NFL franchises. The Oilers, who played their games at the Houston Astrodome, were largely unsuccessful in the NFL until the late 1970s when Adams brought on the wildly popular Bum Phillips as head coach. Couple that with Adams front office staff’s acquisitions of stars like the “Tyler Rose” in Earl Campbell and gutsy quarterback Dan Pastorini, and the Oilers found themselves in two consecutive AFC Championship games which they would eventually lose both to the dynastic Pittsburgh Steelers and their “Iron Curtain” defense. Bud Adams was also a pioneer in having had three African Americans as franchise quarterbacks, the first of which was Warren Moon in the 1980s. In an era where ignorance abounded, most owners felt that African Americans couldn’t play the quarterback position. As a result, Moon was passed on by the NFL and forced to start his pro football career in the Canadian Football League – where he won five Grey Cups. Bud Adams then made Moon the highest paid player in pro football when he signed him, bringing him into the NFL fold. Adams and Moon silenced the critics of the day as Moon went on to become one of the greatest quarterbacks of all time and was admitted to the Hall of Fame five years after his playing career ended. The Oilers made the playoffs every season between 1987 and 1993 but never got past the divisional round of the playoffs. The Oilers posted a 12-4 high water mark record in 1993 but were defeated by Joe Montana and the Kansas City Chiefs. Adams made the highly unpopular decision of hosting a fire sale of his team tearing them apart from the ground up and starting over for the 1994 season when the Oilers posted a franchise worst 2-14 record. The Oilers attendance at games dropped sharply and Adams’ unhappiness with the Astrodome as a venue prompted him to make a decision that would shock the football world. Bud Adams make good on threats to move the team when then Houston Mayor Bob Lanier refused to spend any taxpayer money on a new stadium for the Oilers. He successfully negotiated a move to Tennessee for the start of the 1998 season. However, attendance at the soon to be gone Oiler’s games dropped so critically low that the Harris County Sports Authority released Adams from his lease in 1997 when the team began playing its games as the Tennessee Oilers. In 1999 Adams decided his team needed a new identity to match the change of scenery and a committee renamed them the Tennessee Titans adding navy blue to the traditional Columbia blue, white and red color scheme. The Titans came out of the gate swinging posting a 13-3 record and taking the franchise to its first ever Super Bowl, which they lost by one yard on a goal line play, 23-16 against the St. Louis Rams. Adams showed a patience few thought he had by keeping the head coach who led them to that Super Bowl on for 17 seasons. Tennessee would taste the playoffs again and again but haven’t returned to the world’s biggest championship game since. Bud Adams passed away at the age of 90, still living in Houston in 2013 leaving behind an incredible football legacy that reshaped professional sports as we know them. All that’s left is to see if he gets the Hall of Fame nod many feel he so richly deserves for all he did for the sport. Image courtesy of Copyright 2013 by Click2Houston.com. All rights reserved. Bud Adams passed away at the age of 90, still living in Houston in 2013 leaving behind an incredible football legacy that reshaped professional sports as we know them.